The third leg of our Baecation took place in Florence, we pretty much just ate and shopped and it was well worth every penny spent! Lol. 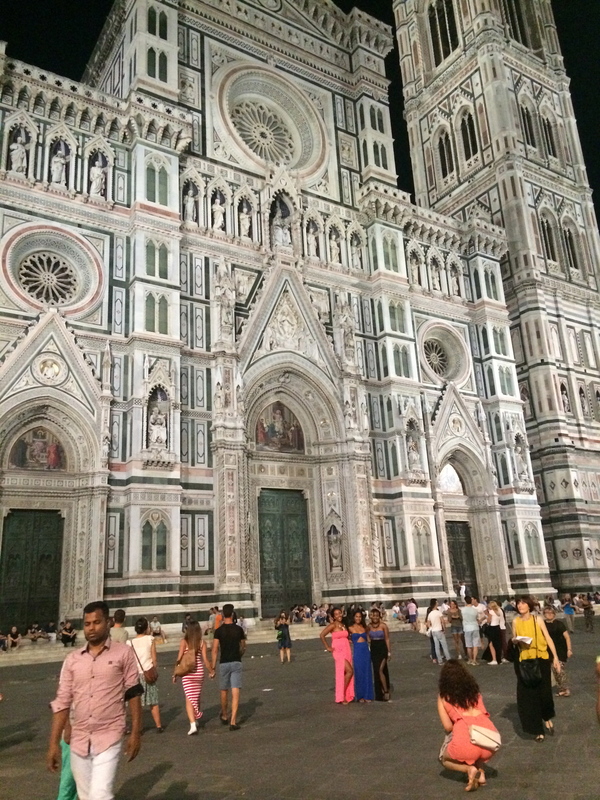 We got into Florence late in the evening so we immediately went to our apartment on Via Tadea, not far from The Duomo Cathedral and got ready for dinner. We met up with one of Chicas friends, Natalia, who she studied abroad with here in Florence. Natalia took us to an authentic Italian restaurant, Acqua al due, where the menus are still in Italian, dinks aren’t served with ice and the menu can’t be altered or you will insult the chef. I loved every minute of it. The restaurant has two other branches in San Diego & Washington DC where they maintain the same Italian traditions. Hailee and I had a classic spaghetti Bolognese, and everyone else had the blueberry steak. The food was so good we went back again before we left. The second time we had a shared salad, the pasta sampler (highly recommended) and we all had the melt in your moth blueberry steak. Our meal was accompanied by a bottle of the house red wine – amazing – and for dessert we had the strawberry wine which was possibly one of the most delicious things I have ever tasted. I’d go back to Florence just for that steak. After dinner Natalia took us on a night tour of Florence, which was so nice because we got to se the city without the streets being flooded with tourists. 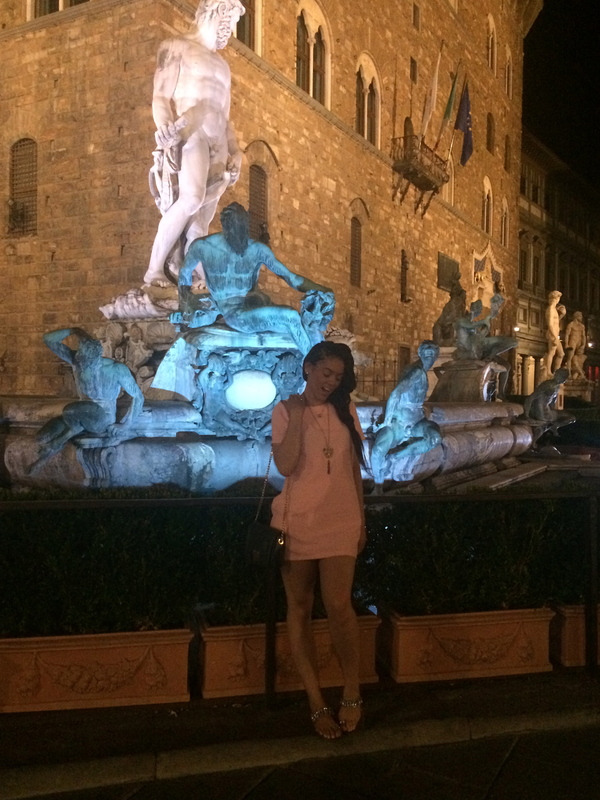 Florence is equally as beautiful a city at night as it is in the daytime. At the end of our mini tour we stopped by a bar that Natalia’s friend owns and had a little nightcap. It was the perfect end to a lovely evening! Chica left back to NYC the next morning and the group was down to 4! 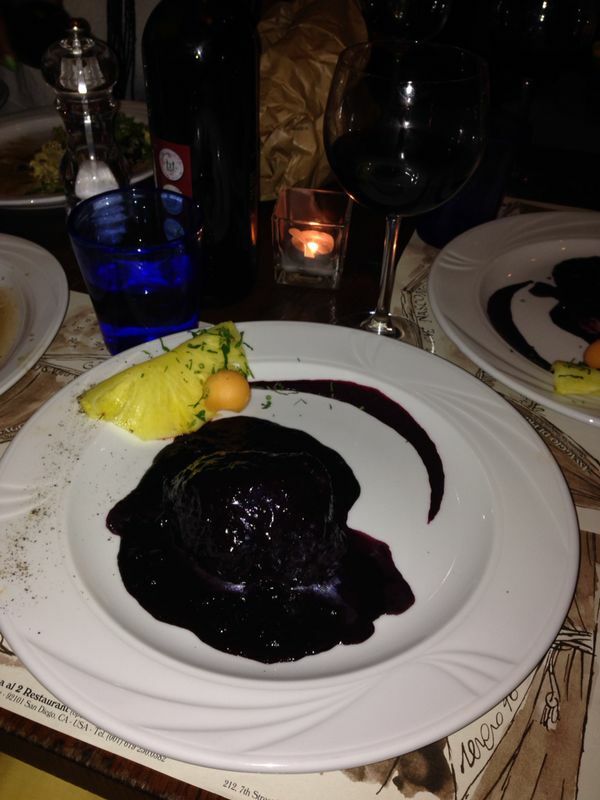 The blueberry steak at Acqua al Due – This picture doesn’t even do it any justice! We spent the morning of our first full day in Florence just exploring our area and went to lunch at a great pizza and beer place around the corner from our apartment called Mostodolce. I had an amazing duck pizza, which I never would have thought would be a good combination! Their menu is exciting and their beers are pretty good too if ou are a beer kind of person. 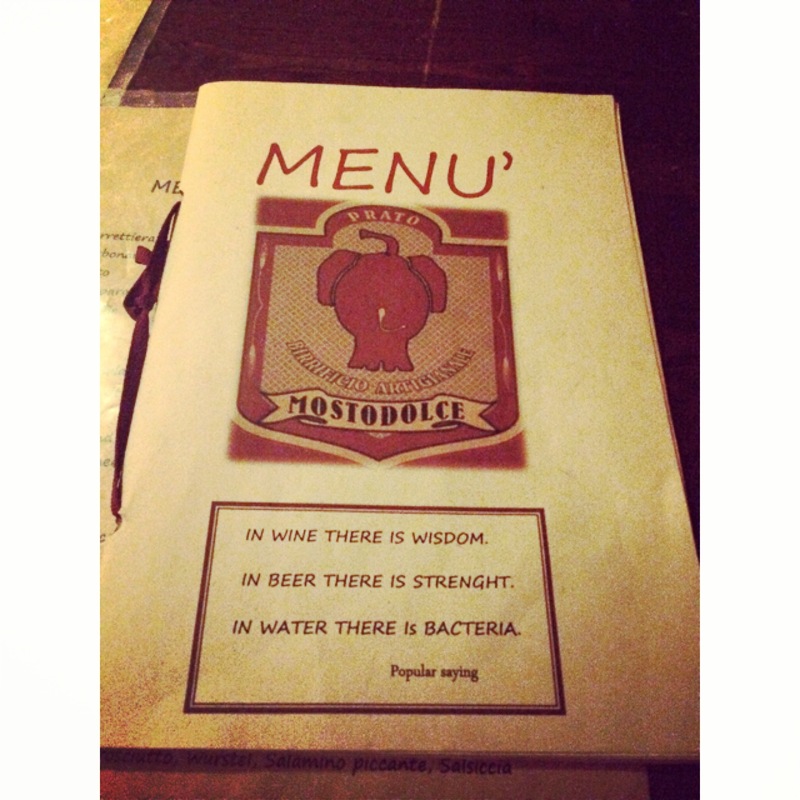 I love the Mostodolce menu… Obviously the person writing the menu was very strong! About an hour before sunset we walked to Piazza Michelangelo to watch the sun set. The walk up is quite treacherous but well worth it (you can take a bus if you aren’t much of a walker). We brought some wine with us and there was a guy singing great covers of classic songs. The whole experience was really beautiful and the view of Florence was unreal. We pretty much spent the rest of our time in Florence shopping and eating at local restaurants. Florence definitely had the best food of all the Italian cities/towns we went to. I cant wait to go back. On our last day in Florence our group parted ways. Hailee and I got on a flight to London and Regine and Dacone were headed to Paris. We all met up in London a couple of days later though! Baecation Part 4… coming soon!